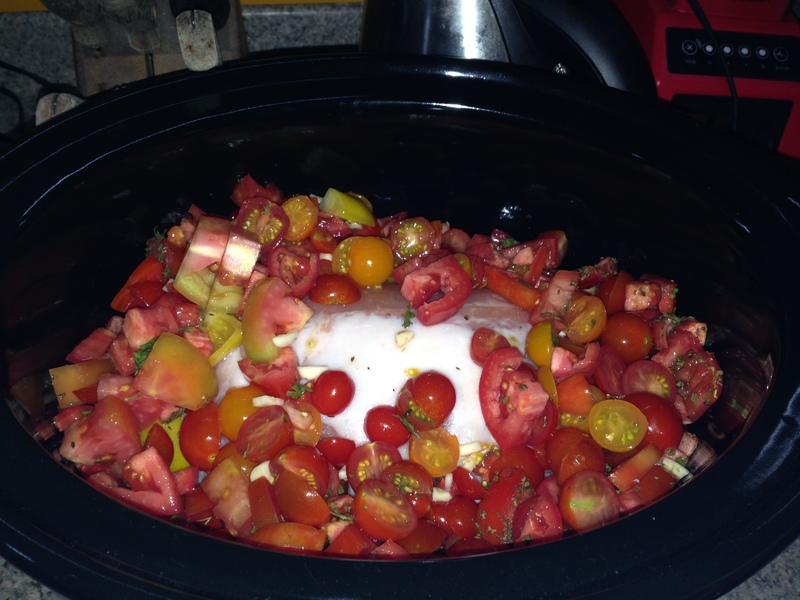 Slowly Cooking Off My Tomatoes | Food It Yourself! Yup, that’s a local apple in there. Yes, the Food It Yourself 2017 garden season has been brought to an end. Even after the take down I still had plenty of tomatoes available. My refrigerator was full of the last few pounds of cherry tomatoes. The really hard and green plums and lemon boys got canned, but more on that later. The almost-but-not-quite-ripe ones went into a big bowl with an apple which was placed in a crimped-closed paper bag. This is a better technique than leaving the tomatoes on a sunny window sill. The apple gives off ethylene gas which encourages tomatoes to redden. In fact, the “tomatoes” you find in the grocery store are “ripened” the same way. In just a few days, I had some reddened tomatoes to play with. But what could I do with them during the work week? This is a job for the slow cooker! It all started Wednesday night with the chopping of the tomatoes. I tossed them with a few cloves of garlic (also chopped) and some herbs. The tomatoes went into the refrigerator. I also took a pork loin roast out of the freezer to thaw in the fridge. (You could use stew beef, mutton, ox tail, chicken…or just go meatless. ) I took my slow cooker off the shelf and left it on the counter top, just to make sure I would remember to do the next step. 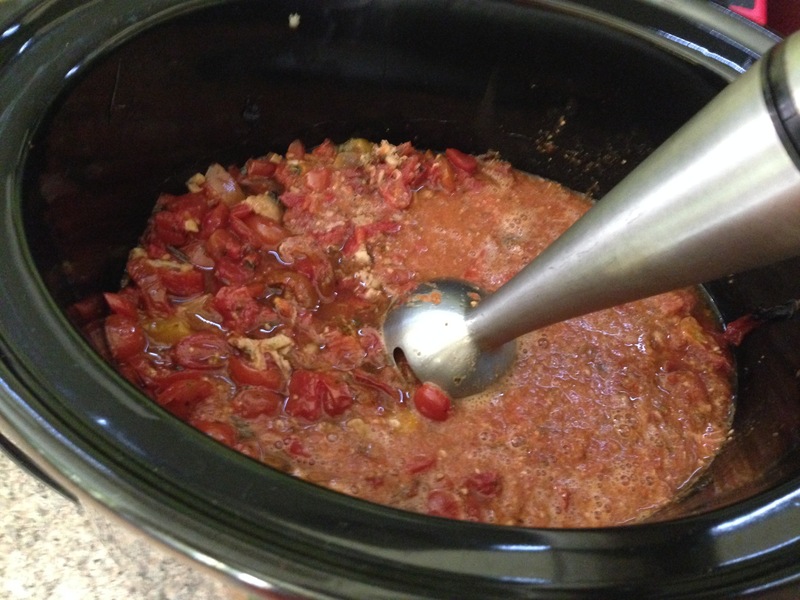 On Thursday morning, while my coffee was perking, I put the tomato mixture and the roast in the crock pot and set it to “low”. The roast was still partly frozen, but that is actually okay. 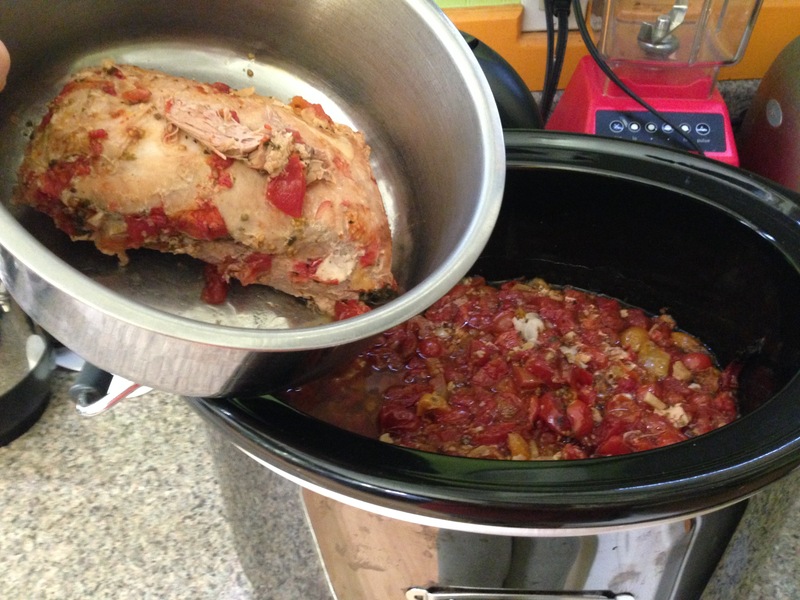 Cooking from frozen is a food-safe method for preparing meat. Bonus- it will help prevent the roast from over cooking. Thursday evening, after a long day of data extraction and research participant screening, I returned home to the most amazing smell- our dinner. I removed the perfectly cooked roast from the crock pot. Using my handy hand blender, I blended the tomatoes. The roast went into the refrigerator, the slow cooker got cranked up to “high” and the lid was propped up open with chop sticks. If dinner time is close you could move the sauce to a pan and reduce it quickly on the stove. Mr. Food It Yourself have a date at the gym, though, so I wanted my tomatoes to reduce slowly. 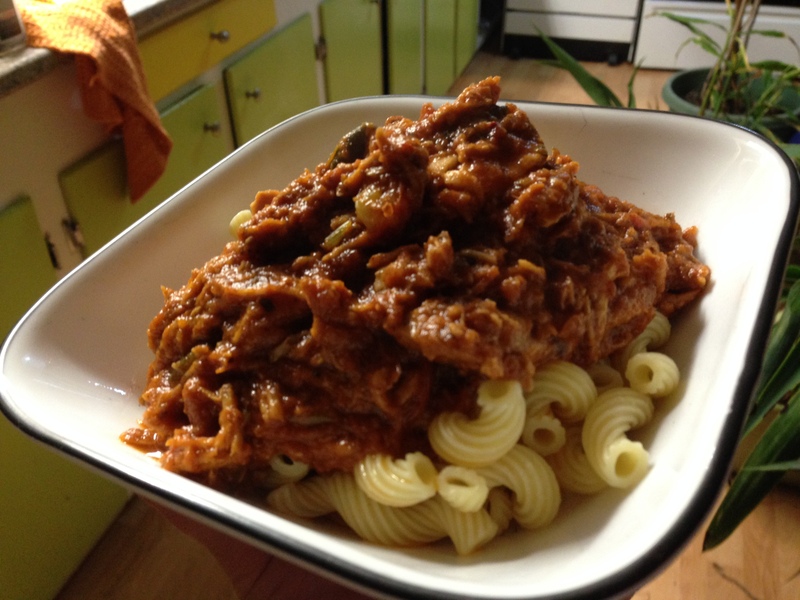 After the gym, I shredded the pork in the evaporation-thickened tomato sauce and let it re-heat. Mr. Food It Yourself cooked up some cavatapi while I showered. He also spiked the tomato/meat mixture with a little home made ketchup and a little home made salsa. It was DELICIOUS! 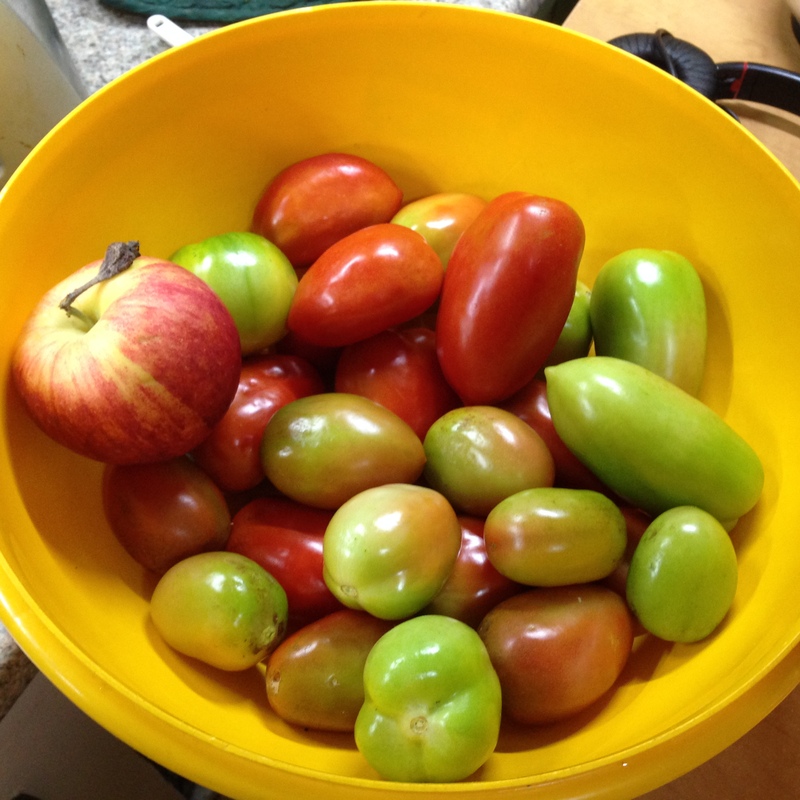 Yes, some of the tomatoes I picked while disassembling my garden got a little fuzzy between harvest and cooking; they ended up in the compost bin. However, I am very happy I found a way to use up as many as possible- on a week night even! With a little thought, a little advanced preparation, and the right tools your DIYet can make the most of the food you acquire. What is your favorite DIY dinner for a week night? Share in the comments!